Dailene O’Neill, Terry Stewart and Doug Grant are a dynamic trio of food lovers who roam the streets of Victoria in search of the next fix of culinary delights and can often be found teasing others with the tales and photos of their delicacies on social media. January and February are the dog days of the year for the avid restaurant goers. There’s the dark, rainy and windy nights that make venturing out less attractive. Not to mention the bills and sins to account for from the tail end of the previous year. Which is why the Dine Around season is always a nice way to get back into the groove. And this year it’s going on for a couple of extra weeks. Bonus. We’d probably still be reluctant to get out and about but since Jen is looking for some guest reviewers, we’ll take one or two for the team and sacrifice our wallets and palates for the greater good. I had not participated in Dine Around for a long time. 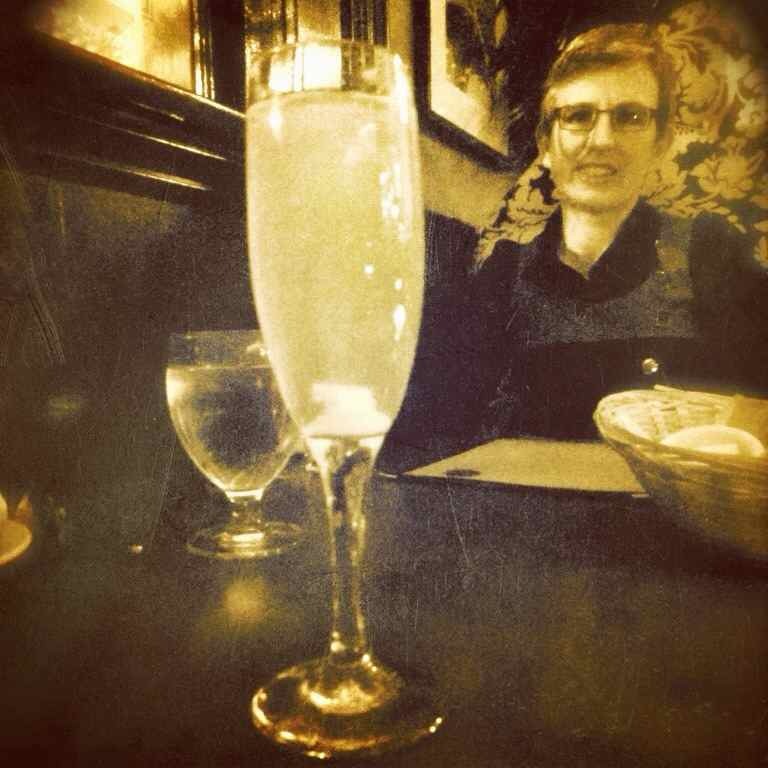 After several good Dine Around experiences, one particular one several years ago, at a restaurant that shall remain nameless, was such a disappointment that I had stopped going. However, thanks to a call for guest reviewers from JenArrr for her blog I decided it was time to try again. 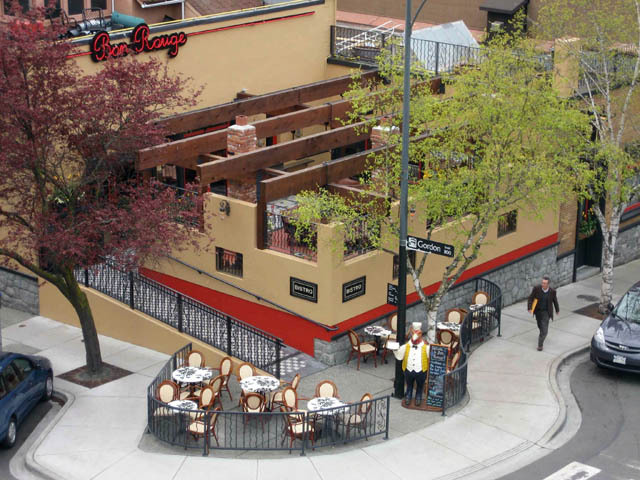 After perusing all the online menus, all three of us agreed that Bon Rouge was the place to go. None of us had been there before and had always wondered about it. The closest I had been to it was having my picture taken with the giant chicken that used to reside out on the sidewalk. I decided on the $30 menu and for my first course, I chose Prawns Provençale. When it arrived I noticed that the plate was slightly warmed. A very nice touch. The prawns were tender and the sauce just slightly sweet from the tomatoes. 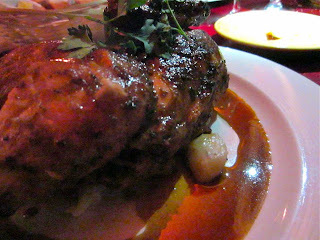 Because I really liked the picture with the chicken, I chose the rotisserie chicken with crushed potatoes with sherry gastrique as a main. What arrived was 1/2 a chicken that took up most of the plate. The skin was dark and tasty and the meat so tender and moist. Dessert was a toss up. Had crème brûlée been an option on the $30 menu, I probably would have chosen it. 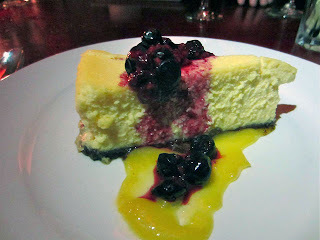 I’m so glad it wasn’t because it let me order the baked cheesecake with lemon curd and fieldberry compote. The cheesecake portion had a thin graham crust and the filling was so light and creamy. The lemon curd was a perfect balance between sweet and tart and the berry compote excellent. Besides the food, what impressed me was the service. Our waiter Yuri was excellent. He was busy but efficient. Refilled water glasses, cleared plates in a timely manner and had very good timing for bringing courses and checking in. After this Dine Around experience I know two things, I will be going back to Bon Rouge to try the regular menu and I will once again be participating in Dine Around. From the moment I looked at the Dine Around menu, I knew that the “Pork Platter” on the $40 menu was for me. It was the braised pork cheek that got my attention. But I’ll discuss the main shortly. For an appetizer, I had the chilled seafood with dill crème fraiche and radicchio. The very first taste was a smoked firm white fish. It was the taste twin of the fish my Dad smokes immediately after he hauls them out of Stuart Lake, near Fort St. James. It conjured up a memory of watching him pull the fish out of the smoker to taste right away. The seared tuna and shellfish were very good with the crème fraiche balancing the bitterness of the radicchio. While a purist may have gone with a white wine, the house red went very well with this dish. For the main dish, the braised pork cheek came with rotisserie porchetta and roasted bacon (pork belly) on top of some finely cubed root veg. For me the star of the show was the cracklin’ on the bacon, but everything was fantastic. With the three types of pork and the incredibly flavourful vegetables, every fork full was something new and tasty. 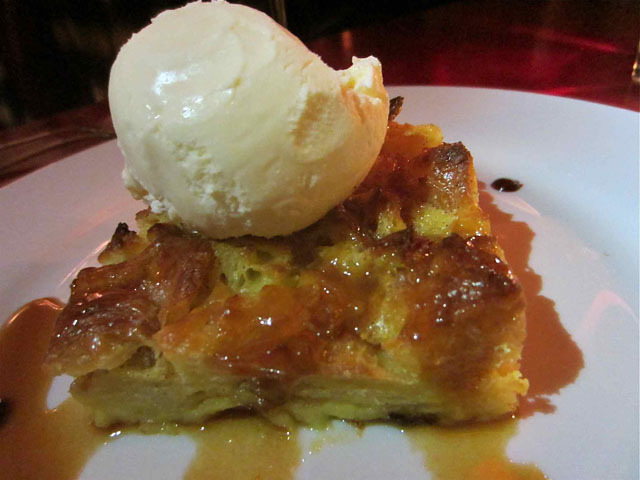 The dessert was a white chocolate croissant bread pudding with a big scoop of ice cream. Together with a decaf Americano (if I want to sleep, any coffee after 4:00ish needs to be unleaded), this was a great finish to the meal. This was our first time at Bon Rouge, the décor was very nice. We were seated right next to the kitchen so it was a bit noisy, but there is a certain amount of hubbub in any busy place, and every seat was full. The service was excellent, Yuri was very efficient and attentive. I definitely want to go back. Bon Rouge was a win in all categories for me. My first impression of Bon Rouge was that it was a toasty refuge from the cold, windy weather outside. The décor, which is broken up into several smaller rooms, features warm colours with lots of red, ivory and black, befitting the French theme. Like the bekilted Terry, I chose the $40 menu option. 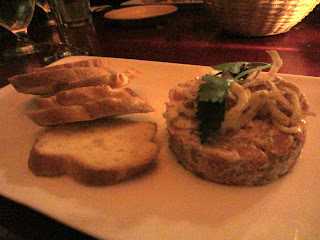 For an appetizer, I had the beef tartar, which came in the form of a large puck-shaped combination of the beef and grainy mustard, topped with crispy buttermilk fried shallots. This dish appealed to me for two reason – the idea of eating raw meat like a regular Joe Cro-Magnon and the added bonus that it reminded me of Kurt Weill’s “Cannon Song” with the lines “they quick as winking, chop them into beefsteak tartar.” It’s always better if you can give yourself an ear worm that you actually like. The appy was quite tasty and the crispy onions were a nice counterpoint to the softer beef mixture. 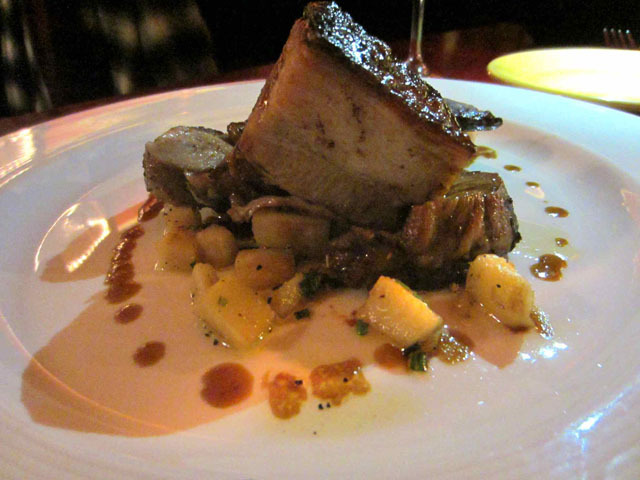 For my main, I also picked the rotisserie porchetta, braised pork cheek, pork belly with the root vegetable hash. My first bite was of the veggies and I have to say, it was amazing. It was no afterthought of an accompaniment and was incredibly flavourful, dotted with demi glace. All three kinds of pork were also delicious and this entrée was probably the tastiest pork dish I’ve ever had. I went with the server’s recommendation of the Burrowing Owl merlot, which nicely cut through the fattier textures and flavours of the pork. It was a good choice. For dessert, I went for the classic crème brulee which featured a bonus dark chocolate truffle, along with a nice cup of coffee. It was a perfectly good brulee but not quite as memorable as the first two courses. Not only was the evening at Bon Rouge a nice Dine Around experience, I thought it was one of the best restaurant meals I’ve had in a long time. I know it’s going to end up on my list of top 5 meals of 2012.